The five days between July 20 and July 24 in 1974 were the most turbulent, and the most decisive, in modern Greek history. The Turkish invasion to Cyprus, the collapse of the seven-year junta and the birth of the new Hellenic Republic, all took place within that short period. Turkey’s attack on Cyprus created a domino effect that made the dictatorship crumble as Dimitrios Ioannidis gave up his rule on July 23 and called for a government of national unity. A day later, self-exiled to Paris Constantine Karamanlis arrives to Greece on the airplane of French President Valery Giscard d’Estaing. Karamanlis immediately formed a government of national unity to heal the wounds of the seven-year military rule and made some quick and decisive moves. It was dawn on July 24, 1974 when Karamanlis arrived with thousands of people welcoming him at the airport carrying white candles that signify the Resurrection of Christ. The reception of Karamanlis, with people celebrating and dancing in the streets, was an outburst after seven years of repression. On July 25, 1974, Constantine Karamanlis addressed the people of Greece asking them to show political maturity in those difficult times. On the same day, in Geneva, the Greek-Turkish negotiations on the Cyprus crisis were launched. Head of the Greek delegation was Deputy Prime Minister and Minister of Foreign Affairs Georgios Mavros. 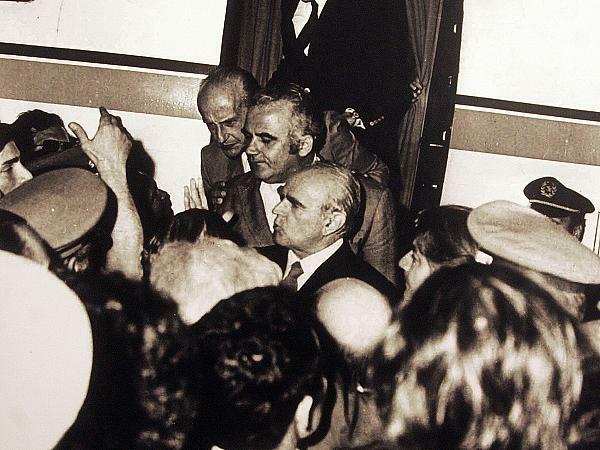 On July 30, 1974, an agreement was reached in Geneva on the restoration of the constitutional order in Cyprus, as well as the recognition of the existence of two separate administrations. Negotiations continued. On August 15, in a new speech to the Greek people, Karamanlis stated that “the armed confrontation of the Turks in Cyprus became impossible due to distance and due to the known fait accompli.” The ceasefire in Cyprus took place at 18;00 on August 16, 1974. On the homefront, the political forces of the country managed to establish the most complete, up until then, political system of the Hellenic Republic. In particular, following the establishment of the National Unity government and the handling of the consequences of the Cyprus tragedy, all political formations, including the Greek Communist Party (KKE) — which had been outlawed since 1947 — were in place for the upcoming elections of November 17, 1974. On December 8, in a referendum over the establishment of a Republic or the return of exiled King Constantine II, 69.2% of Greeks decided on a Republic and 30.8% on the return of the monarch. Thus the modern Hellenic Republic was established.